After the completion of the 2015 Russian Championships, the Russian Swimming Federation (RSF) has named 33 swimmers to their roster for the 2015 World Championships which will be held in the Russian city of Kazan. Russian 16-year-old Daria Ustinova broke her own Junior World Record in the 200 meter backstroke to highlight the second day of Russia’s national championships. 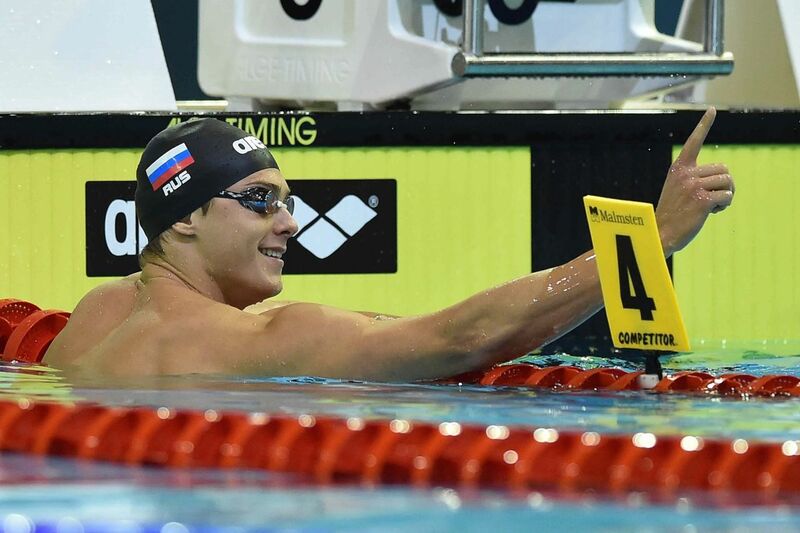 On the third day of Russian Nationals, Vlad Morozov took over, winning two events including the 100 free, where he became the first man in the world to crack 48 this season. Morozov went 47.98 to win the national title by four tenths. He leapfrogs Australia’s Cameron McEvoy for the world lead. According to the Russian Federation’s website, the Worlds Team is being selected based on the 12th-fastest time from the last World Championships in each Olympic-distance event, and the 10th-fastest time in each non-Olympic distance race. Based on that standard, three others made the Worlds team in the 100 free: Alexander Sukhorukov (48.33), Daniel Izotov (48.41) and Andriy Grechin (48.64). Morozov also won the 50 breaststroke, going 27.37 and also making the Worlds cut. Alexander Kudashev won the 200 fly in 1:56.30, making the cut for Worlds. Vitalina Simonova (2:23.56) and Andreeva Sofia (2:25.14) also got under the mark, placing 2nd and 4th. In between was Turkey’s Viktoria Gunes Zeynep (2:24.48). Anastasia Fesikova won the 50 back, making the Worlds cut time with a 28.18. Other winners were Ivan Trofimov in the men’s 200 IM (2:00.08) and Elizabeth Gorshkova in the women’s 1500 free (16:39.98). Veronika Popova won the semis of the women’s 200 free, going 1:58.05. Viktoria Andreeva sits second at 1:58.25. Grigory Tarasevich leads the men’s 200 back with a 1:58.53, but 100 back champ Evgeny Rylov is behind him in 2:00.41. Natalia Lovtsova is the top qualifier out of the women’s 100 fly with a 58.26, with Anna Polyakova and Svetlana Chimrova tied for second at 58.92. Well, not as quick as he was at 2013 worlds, which is still basically my favorite race from an entertainment standpoint. He had a piano on his back the last 25. A suicide race. Relive it in all its glory. That will forever be remembered as to not what to do. Can’t honestly imagine what he was thinking. After he went that 40.7 at NCAA’s, he said he just went out as hard as he could. My guess is he was hoping to replicate that, then found out the hard way that long course is a different beast. Ervin’s strategy in Fukuoka was probably his only chance of beating Hoogenband, and it paid off because if you rewatch that race, I’m pretty sure he was about 0.4 ahead at the 50 and ends up winning by only 0.1! Considering it was a feet touch at the flip, his split would probably equal to a 21.5 or 21.6 hand touch, meaning he could have been on the podium of the 50 free !!!!!!!!! Nobody has ever been out that fast, the second under 22 was Alain Bernard who flipped at 21.97 in a smaller meet. Mohsin, I’ve rewatched that race many times: I have always loved Ervin’s technique and approach to racing and I believe he is one of the most talented sprinters ever. In terms of pure speed over the water, he is just wow. I ain’t bashing him, either. Go big or go home, baby! Sedov did not swim the 100 free?